DAYTON, Ohio – Syracuse Orange defeated the Arizona State Sun Devils 60-56 in Dayton, OH on Wednesday night. The first half was back-and-forth as both teams struggled getting shots off and had a hard time maintaining possession of the ball. First two plays of the game were a turnover by Frank Howard and an air ball by Arizona State’s senior guard Kodi Justice. Howard turned things around and scored eight straight points for Syracuse to give them an early 10-7 lead. Despite a tough start, Syracuse managed to maintain a lead over the Sun Devils for a majority of the first half. With two lead changes that lasted no more than a minute each, the Orange went into halftime with a 30-28 lead over Arizona State. As the clock started in the second half, Arizona State’s offense made it seem as though they were about to take over the game. The Sun Devils started the second half with an 8-0 run. ASU’s senior guard Tra Holder opened the half with a three, followed by fellow senior guard Shannon Evans II draining one of his own from downtown. Third and final senior Kodi Justice ended his basketball career with the Sun Devils scoring 15 points. With about seven minutes to play in the second half, the Orange came back from a seven-point deficit to win it in fashion. 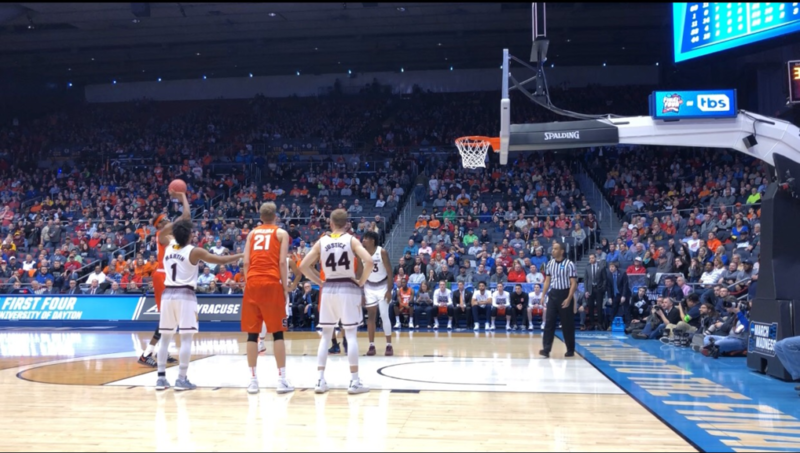 Syracuse fans in the arena were hoping to keep the dance going in Detroit and that is exactly what they got, but not without a little trial and tribulation. The Orange were led by freshman guard Oshae Brissett as he scored his 13th double-double of the season with 23 points and 12 rebounds. The true battle was between both teams’ alternating defense. With less than two minutes to go in the second half, ASU was within three, 55-52. The clock was ticking and it all came down to defensive play. With 51 seconds left, SU led 55-54 and was able to hold onto that lead as ASU continued to foul Syracuse four times in the last minute of play. Paschal Chukwu stepped up to the line with the chance to ice the game and that he did. “We made plays in the end that we had to make,” Boeheim said. Oshae Brissett, Marek Dolezaj, and Paschal Chukwu each had 2 fouls headed into half-time. Foul trouble seems to be the true test for the Orange game in and game out. Arizona State put some pressure on Syracuse offense and whatever head coach Bobby Hurley was telling his Sun Devils to do, it was working. “They made it very difficult for us to score,” Boeheim said on ASU’s defense. Sun Devils pushed through SU’s length and were able to draw 16 fouls off the Orange, both offensively and defensively. The Orange managed to reset after the half and try to maintain control of the game, without fouling. “It’ll be a real challenge for us, but we have played really well coming back this year. We’ll be ready to play Friday,” Boeheim said. Syracuse Orange travel to Little Caesar’s Arena where they will take on the Texas Christian Horned Frogs on Friday in Detroit.